Charlotte is stapling her stomach back together where the guy stabbed her. She calls someone for a favor. Amenadiel is fascinated that he has the final piece to the Flaming Sword. Amenadiel thinks he's the favorite son, but Lucifer thinks they're being manipulated by God. Amenadiel won't give Lucifer the key and leaves. Dr. Linda finds Charlotte in her office. Charlotte wants Dr. Linda to help heal her. Dr. Linda doesn't want to, but Charlotte basically forces her. She uses duct tape to tape Charlotte off. Lucifer and Chloe get to a crime scene where a guy is charbroiled. It's the guy who stabbed Charlotte. Lucifer goes to Dr. Linda's office and finds Charlotte. Lucifer thinks they're getting it on, but he sees there's something wrong. She tells him she's bleeding light and tells him she killed Chet accidentally. He's freaked out that Chloe will discover Charlotte is behind the killing and she'll turn to toast - quite literally. 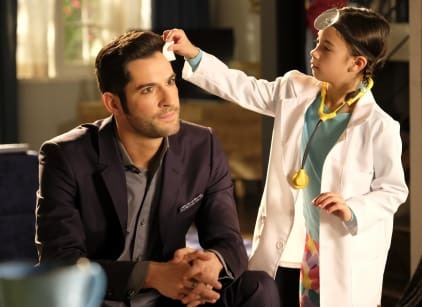 Lucifer visits Maze and comes across Dr. Trixie. He talks to Maze about Amenadiel while Trixie fixes him. Maze says she'll help him. Chloe talks to Chet's brother about the case. Lucifer inadvertendly gives Ella a clue and she searches satellite footage for the killer. Amenadiel is at improv talking about him being the favorite son. The they restart after Dan tells him not to talk about religion, but Amenadiel is not doing a good job. He just doesn't get it. Lucifer and Chloe have found a picture that leads them straight to the van. Two people come out with a body and Chloe pulls a gun. The girls explain that they remove bodies. Chloe gets aggravated that Lucifer is hiding something. Dan tells Amenadiel he's going to get the hang of it. He hugs Dan. Maze finds Amenadiel and zaps him to take him to Lucifer. Ella asks Chloe if the two cleaners are legit or not. Lucifer tells Amenadiel he wants the key. Amenadiel doesn't want to give it up because he thinks Lucifer and Amenadiel want to destroy God. Lucifer tells Amenadiel that Charlotte's powers are returning. Maze comes back and tells them that Charlotte is gone, but Charlotte visits Dr. Linda again with a bottle of wine. She wants to know what Linda meant when she thought Lucifer wounded Charlotte. Charlotte threatens Dr. Linda if she doesn't tell her what she knows. Chloe and Dan find another charbroiled body. Chloe questions one of the girls to find out what she knows and the girl admits to taking care of bodies but won't give up who did it. Chloe calls Lucifer and tells her what's going on and wants him to do his mojo thing on Kathleen. While she's on the phone Charlotte walks in. Charlotte wants to know what's going on. Lucifer wants to send Charlotte back to Hell to rule it. She tells him she persuaded Dr. Linda to tell her what was going on. She's more powerful than ever. She throws them across the room and demands Amenadiel give her the piece. He refuses and she tells him she'll find another way. Amenadiel goes to check on Linda while Lucifer chases after Charlotte. Dan and Chloe arrive at an amusement park to arrest Charlotte. She calls him to tell her she's at Santa Monica pier where she might charbroil lots of people. She only wants to talk to Chloe and they go outside. Maze finds Linda and she's not doing well. She's sort of burned up and has a serious wound in her stomach. Amenadiel comes upon the scene. Lucifer finds the key on Dan when he arrives. Lucifer arrives with the Flaming Sword. Then Chet's brother shows up to shoot Charlotte for betraying his family. Amenadiel says Dr. Linda won't make it to the hospital. He tries to gather some of his powers to save her. he slows down time to save Dr. Linda and in the meantime Lucifer saves Charlotte from being shot. He gets her to the beach and ignites the Flaming Sword. He's going to send her back and she tries to talk him out of it. Lucifer cuts open a hole to "nothing" to send Charlotte where she can create her own world. He doesn't want there to be a war in heaven. She goes into the "nothing" to create her own world and throws the Flaming Sword in the hole as well. Charlotte's body dies. Amenadiel is exhausted and Maze is able to get Dr. Linda to the hospital in time. Charlotte Richards didn't die. She's very confused about what's going on. She doesn't know Dan or anyone. Lucifer visits Dr. Linda is in the hospital. It looks like she's going to be okay. Lucifer calls Chloe to tell her he's going to tell her the truth about him. he gets whacked and knocked out and finds himself in a dessert somewhee shirtless. He has his wings back.